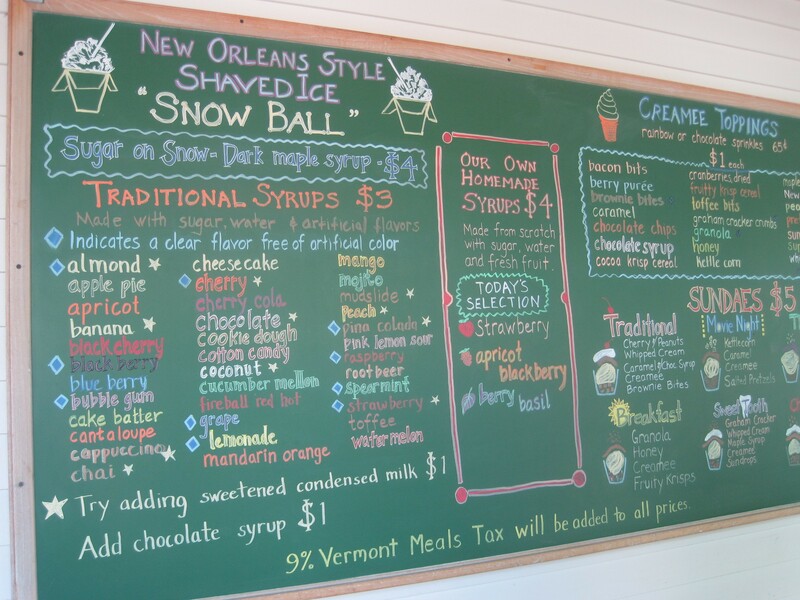 Vermont is creemee land. That leaves little room for other varieties of frozen treats. Big credit then, to Sweet Clover Market in Essex. 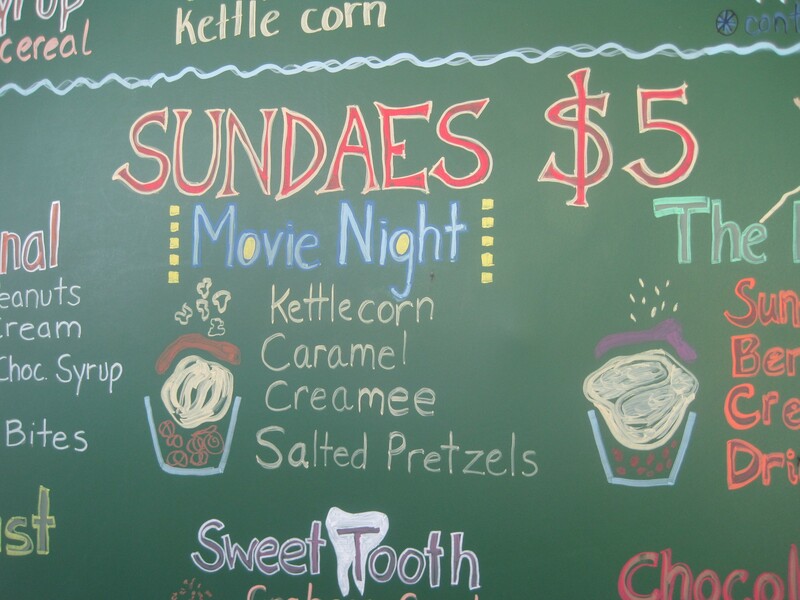 The locavore market in the Essex Outlets & Cinemas boasts a hidden treasure no other natural foods markets in the area do: A patio with not just creemees, but a varied menu of New Orleans-style snow balls. Last Saturday, I grabbed my grandma (and boyfriend) for an afternoon of icy fun by the market's side window. The sunny patio is shaded by big, floppy umbrellas, so eating al fresco was no threat to my pallor. I had trouble deciding among the 35 traditional syrup flavors and three homemade, natural ones. Would I go ultra-fake with Cotton Candy or Cookie Dough? After I ordered, the market's owner, Heather Belcher, mentioned one of her favorite combos, the chai flavor with sweetened condensed milk. The result, she said, resembles the flavor of a Thai iced tea. First priority was the homemade berry-basil. But I couldn't settle on just one syrup, so cucumber-melon would have to come along, too. At $3 and $4, respectively, I figured I could afford it. 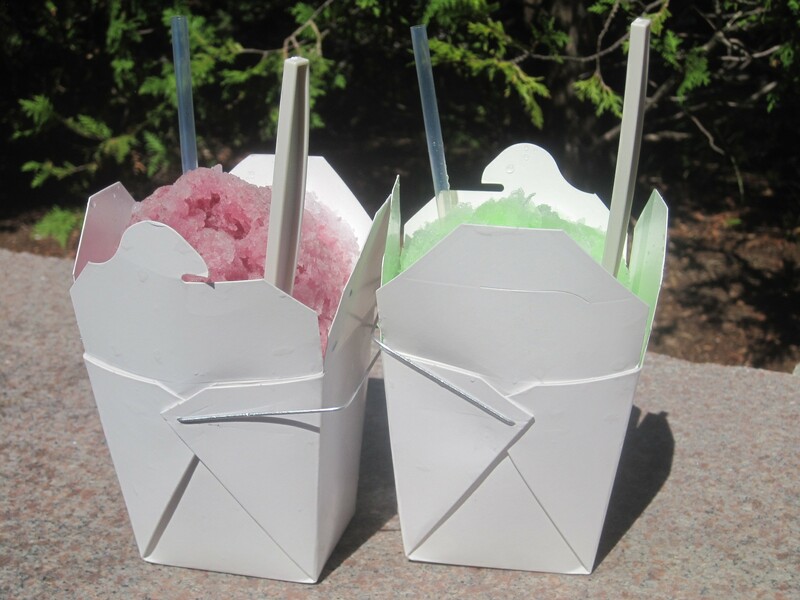 What I didn't expect was to receive two good-sized Chinese take-out boxes filled with sweet ice. Each came with a spoon for eating when the ices first emerged, and a straw for enjoying them as they melted. I clamored for a taste of the berry-basil, but was disappointed to find something in my mouth that tasted like iced Dimetapp. There wasn't much flavor of berry or basil. Belcher asked how I liked it, and when I told her the truth, she insisted on reimbursing me, saying she hadn't had the chance to taste the new flavor before serving it to me. She offered me an alternative (that Thai iced tea would have hit the spot), but I had more than enough on my hands with the cucumber-melon ice. The bright-green honeydew-flavored syrup reminded me of the shaved ices I grew up eating at the sweets counter at Meiji-ya, my favorite Japanese market in Yonkers, N.Y. A hint of aromatic cucumber made it all the more refreshing on a hot day. 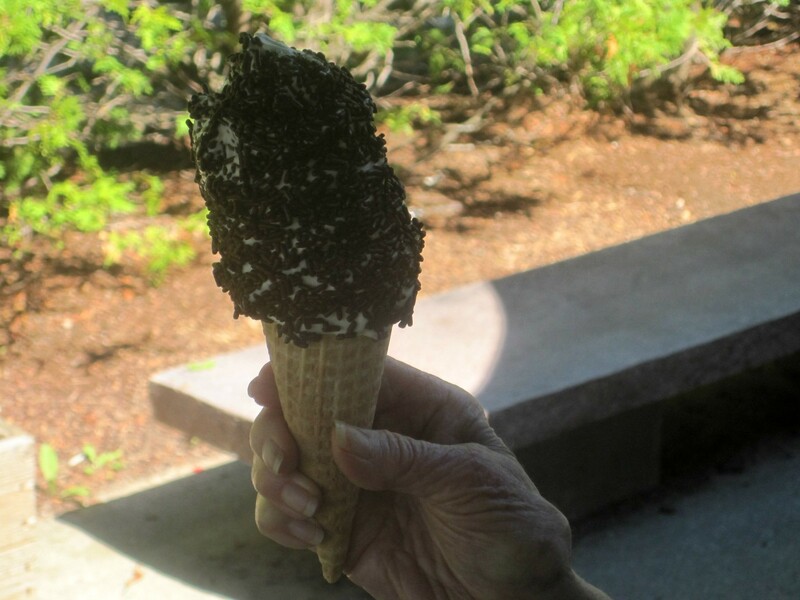 Grandma was overwhelmed by the size of her vanilla creemee topped in chocolate sprinkles. But she was impressed with the thick, smooth creemee mix from Kingdom Creamery of Vermont in East Hardwick. My other half, the real sweet tooth in our party, was most curious about trying a more complicated form of the excellent local creemee. The menu of six original sundae combinations included a "healthy" one with nuts and berries, along with a "breakfast" version featuring granola, honey and a fruity crisp cereal. But I was glad he chose the "Movie Night." A study in sugar and salt, the vanilla creemee rested atop a layer of pretzels. The thick dose of crunch might have been overkill for some, but I placated my destructive tendencies by tearing noisily through the snack. 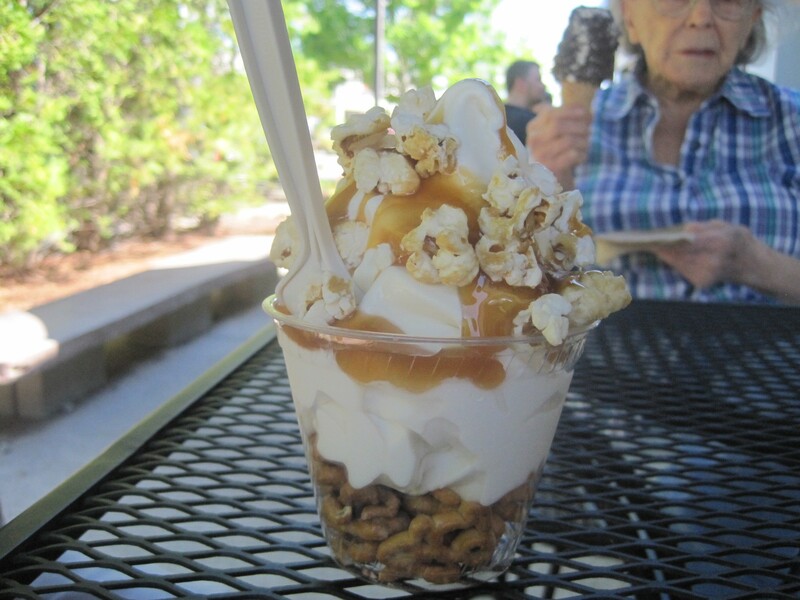 Viscous caramel and sweet, salty kettle corn tied the sundae together. Perhaps it wasn't as refreshing as a cucumber-melon shaved ice, but it didn't matter. Our savory and sweet cravings were fulfilled. We weren't hungry again until midnight.